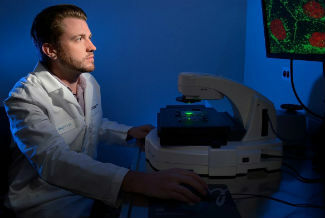 Led by Assistant Professor James Smyth (pictured here), a team of researchers at the Virginia Tech Carilion Research Institute used super resolution microscopy to gain insight into how an individual cancer cell can alter its genetic instructions to metastasize throughout the body. Scientists at the Virginia Tech Carilion Research Institute have added a new dimension to the understanding of how cells alter their communication with one another during development, wound healing, and the spread of cancer. The researchers published their results in Molecular Biology of the Cell, a journal published by the American Society for Cell Biology. When tissue grows or heals, its outer layer of epithelial cells takes on characteristics that allow cells to migrate, change their size and behavior, and act as other cell types, specifically multipotent mesenchymal cells that are useful for making repairs. The process is known as the epithelial mesenchymal transition, or EMT. Smyth said researchers will also be able to use their techniques to better understand cellular responses to injury and disease in other pathologies, such as cardiac disease, as well. Smyth normally studies communication between cardiac cells, with a specific focus on the role of a type of protein called connexin 43. Connexins are found in every tissue of the body. When six connexin 43 proteins come together, they form channels called gap junctions through which cells communicate. Historically, people thought that the more connexin proteins in the cell, the more gap junctions the cell would make, thus enriching cellular communication. Like all proteins, connexin 43 is synthesized from the message encoded in RNA that has read out the DNA code. The RNA can also encode for smaller pieces or fragments of connexins 20k, that ensure gap junction formation. In this study, Smyth found that RNA and protein synthesis of connexin increased during EMT, but the amount of gap junctions on the surface of the cell did not increase as expected. In an effort to understand why, Smyth collaborated with Samy Lamouille, a research assistant professor at the VTCRI. Lamouille is an expert in EMT and the cellular signaling involved in protein translation, which he has studied since he was a postdoctoral associate at the University of California San Francisco. Lamouille, who is also a research assistant professor of biological sciences in Virginia Tech’s College of Science, focuses on understanding the mechanisms that regulate cell-to-cell interaction in cancer and how deregulated intercellular communication can lead to cancer progression through EMT. “In this study, we found the formation of gap junction structures that allow cells to communicate was disrupted during EMT despite an abundance of connexin 43,” Lamouille said. Normally, the cell makes the 20k connexin fragments to direct the full-length connexin 43 to the surface of the cell — a process that becomes altered to the detriment of gap junction formation. Smyth and Lamouille hypothesized that the connexin (20k) fragments were being suppressed during the internal translation process of protein synthesis. The researchers used the VTCRI’s super resolution microscope to examine individual molecules and to analyze the connexins within the cells. They found that the full-length connexins were arrested in the cell’s Golgi apparatus, which acts as a packaging plant for proteins heading to the surface of the cell. To counteract the suppressed expression of 20K connexin fragments, Smyth used a lentivirus vector to cause the cells’ RNA to make 20k connexin, thereby rescuing the full-length connexin 43, the formation of gap junctions, and normal cellular communications. Smyth is now applying the information he learned in this research to cardiovascular disease, where he’s seen the same cellular communication issues. Other contributors include co-first author Carissa James, a doctoral student in Virginia Tech’s translational biology, medicine, and health graduate program; co-first author Michael Zeitz, a research scientist in Smyth’s laboratory at the VTCRI; and Patrick Calhoun, a graduate student in Smyth’s lab at the VTCRI who is earning his doctorate from the Department of Biological Sciences in Virginia Tech’s College of Science. The work was funded by the National Heart, Lung, and Blood Institute of the National Institutes of Health and VTCRI.